Driving to the airport with your car sometimes looks like the most comfortable choice. It gives you the freedom to choose the time of departure freely and to travel at your own pace and in the privacy of your own vehicle. However, there are always two sides of the medal. Travelling to the airport with your car also means that you (can) meet unexpected traffic congestions that can make your journey to the airport a pretty hectic experience. We listed some of the most common situations that may occur on the journey to the airport and compared the ride with your car to the ride with GoOpti. Take a look! GoOpti vans are constantly being monitored via GPS by the Operations center and in case of traffic congestions, the operations officer (also called guardian angel by the drivers) calls the driver immediately, offering a detour through some local roads. This allows the GoOpti van to get to the airport faster and more safely. Well, tough luck, you will probably miss your flight. Yes, all right, it happens, sometimes you just cannot predict some really bad situations, BUT with GoOpti, you will keep a smiling face no matter what. With the Absolutely No Worries package you get the guarantee that if something goes wrong, GoOpti will find and buy you another plane ticket! If you purchased your plane ticket quite cheaply, wait until you reach the airport to sing victory. It can be quite expensive to drive to the airport if you add all the costs of the toll, gas and parking at the airport. At some airports, prices can skyrocket, leaving a bad taste in your mouth. You won’t believe how convenient it can be to travel to the airport with GoOpti. Thanks to the smart technology that optimizes the space in the vans, you can obtain a premium price which includes all the expenses of the ride. Check out our 4 advices to book an extra cheap GoOpti transfer. Driving with your own car gets you to the airport and back home. End of story. Travelling with GoOpti gives you the chance to earn bonus points for your future travels! With the Bring a friend referral program you can get a totally win-win outcome. You get a unique promo code with a 5 EUR discount, share it with all your friends, and when they use it for their first GoOpti transfer, you get 5 EUR for your future trip with GoOpti. Cool, ha? There are more and more cars that pollute the environment, but there are usually only one or two people driving in the car. It’s a shame, don’t you think? 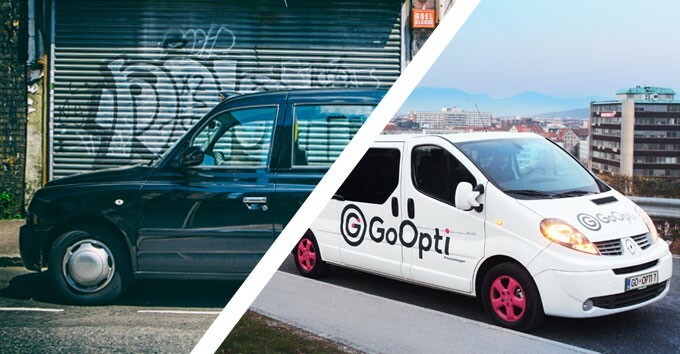 GoOpti uses vehicles for 8 people or more and so far, by joining several people in the same vehicle, it has contributed to saving more than 12,000t of CO2 emissions.